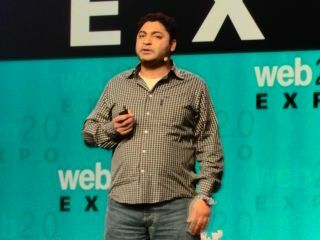 If you thought the NFC chips that Google has started putting into Nexus phones are just there to turn your Android phone into a Google credit card, think again; Google's plans for real-world shopping are much more ambitious than that, according to Google's Osama Bedier, vice president of platforms for mobile and new ventures. It's not just about avoiding the ads for things we already own that 75% of us see online, although Bedier would clearly like to make that more efficient. And when he says that 20% of people are more likely to buy something that a friend or family member has recommended it sounds like the FTC's privacy penalties for Buzz haven't discouraged Google from considering the opportunities in social networking. What Bedier wants to do is use the smartphone - which he calls "the iconic device of this decade" - to bridge the gap between online and offline shopping. "We're about to see some major changes. It has the promise to bring best of both worlds. Online you get unlimited inventory and the best prices; offline you get to touch and feel the product and you get to take it home with you immediately." Some UK stores are already combining the two, he points out, "Dominoes in the UK already gets a third of their delivery orders online. Tesco has the fifth most downloaded app on iTunes that allows you to scan grocery items in the store and put then on your online grocery cart for online checkout." Bedier's vision of the future of commerce "begins to look like shopping did fifty years ago, when everyone shopped at the local store". But instead of the shopkeeper knowing you because you've shopped there for years, remembering your favourites and offering you credit if you've left your wallet at home, Bedier says technology can give shopping the personal and convenient touch. "I should be able to walk in the store and that store greets me. I decide to share my identity, I decide to share my location and when I walk in the store it greets me by name, it tells me the cheese I like is available. The fridge may have already looked at what I'm out of and created a shopping list - and it also included ingredients from recipes I liked on Epicurious. "And that shopping list turns into an in-store map where I navigate the most efficient way. If I get to an item that's out, I scan the barcode and it tells me where else I can buy it or have it delivered to my house. And when I go to check out I walk with that shopping cart directly out of the door. NFC stickers on all the items can actually tell whether the item is paid for or not and the sensor lets it go through." All the technology is there today, Bedier claims - the problem is making it interoperable. "First, payments need to go digital." Today shops make the choice of what payment methods to accept based on things like how much it costs them to process the payments; he wants to see the choice go to the customer. "All my cards - whether they're credit cards, debit cards, gift cards, private label cards - they need to move into the platform, they all need to be digital and they need to be available to me at any store I want to use them. I need to be able to use my choice of cards, not what the merchant wants to accept." And like web sites, stores should tell you what's in stock (think of a Google search that covers physical shops): "Consumers should be able to find an item in real time at any store online or off and to be able to pick it up and buy it right there. Inventory needs to live in the cloud. A merchant used to sell in a physical store and the web came along and they made a copy of that storefront. Now mobile is coming along and that model wont scale any more. Inventory needs to move and live in the cloud." None of that is going to work if you have to create an account to tell every shop you go into who you are. "Identity needs to be interoperable," says Bedier. "The whole idea of going to store by store by store and signing up for gift cards and credit cards, all this signing up - no. Identity needs to work seamlessly across merchants across devices, across use cases." It's a grand vision that needs shops and stores to reveal a lot more information - like inventory levels - than they usually make public; and we're not sure how well banks will take to making all your different cards work on the same payment system or how much we'd like shops that remember us a la Minority Report.